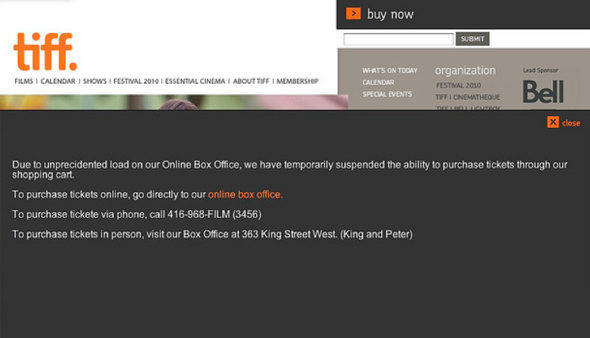 TIFF 2010 is off to a shaky start. First it was a (false) bed bugs scare that reached epic proportions, then last night workers at the Hyatt Regency (the main hotel for the festival) walked out, and now online ticket sales via their shopping cart feature have been suspended due to "unprecidented [sic] load on [their] Online Box Office." Those trying to buy tickets directly from the online box office have also reported troubles with the system. blogTO reader (and sometimes contributor) David G. Tran happened to take in the ensuing line up early this morning, and offered us the following observations. Last night, eager TIFF-goers lined up at the corner of King St. and Blue Jays Way in anticipation of getting first crack at single-screening ticket sales this morning at 7 a.m. Many passers-by likely thought that with the ubiquity of the online marketplace this phenomenon was a thing of the past. But nevertheless, at 7 a.m. the lineup spanned the entire block all the way past Blue Jays Way and Wellington, amidst the noise of the Hyatt Regency Hotel strikers. Those who thought they could beat the line-up were surely disappointed, as they were met with the frustration of overloaded TIFF.net servers. At 9 a.m., two hours after ticket sales went live, TIFF.net closed their online ticket portal due to the overwhelming traffic, asking those who were interested in attending the festival to call (the phone have been jammed since 7 a.m. as well) or visit the box office in person. Now in it's 35th year of operation, TIFF claims to have "a vision of leading the world in creative and cultural discovery through the moving image," but they clearly haven't tweaked their vision to follow the rest of the world in online preparedness for mass ticket distribution. Intro by Derek Flack. Primary writing and images by David G. Tran.